So. This event was announced last autumn, the tickers tickets went on sale – and were snapped up in November. We were promised two magnificent days of great beers and top class food, something way beyond what we have experienced before. First of all – the beers. Full score on this. 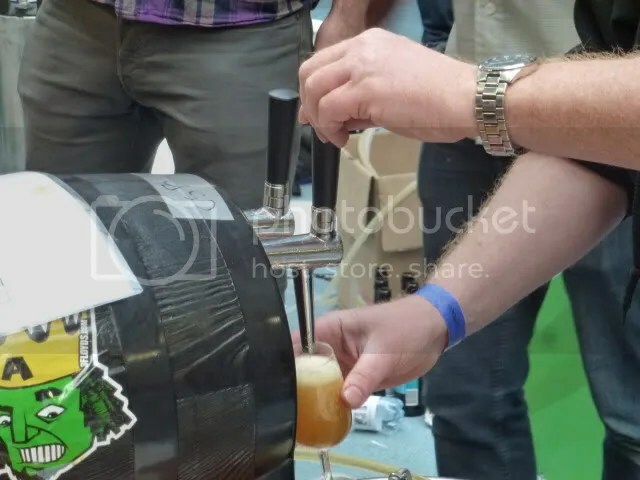 There were world class brews from a number of the best breweries in the world. The hosts had actually toned down their own offerings from Mikkeler and Evil Twin to make room from all the others. Some were household names, like de Struise, Nøgne Ø, de Molen and BrewDog. Some were legendary, like Three Floyds and Cigar City. Some of them were new to me – Broadies (from London) and Farmer’s Cabinet (from Philadelphia). There were sour ales and barrel aged ales. Barley wines and stouts. IPAs and Apas. Even examples of Gose and Berliner Weisse. Some of the line up was changed from the Friday to the Saturday. Some were festival specials, some were rarities very few of us had tried before. So, for the beer selection and the beer quality, I can only applaud. With all the tickets sold out many months ago, there were no long lines to get in either. We were let in, given a few tokens and a wristband showing our dining time. The crowd was different from your average beer festival. 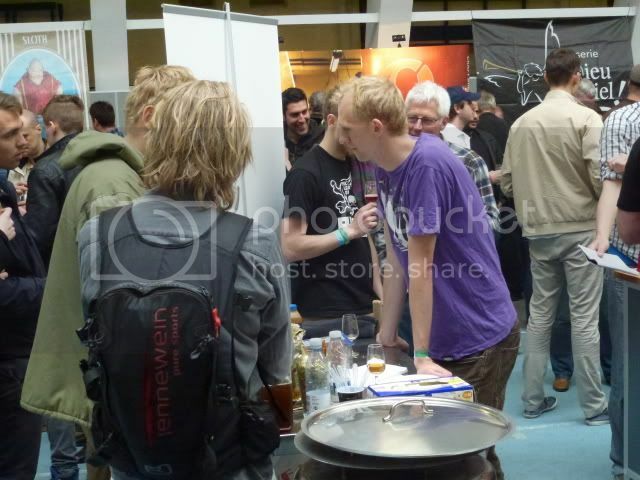 Lots of friendly people from around the world, everyone seriously interested in beer. No stag parties, no one there to proclaim their undying love for their regional brewery. A laid back and friendly atmosphere. What about the venue? Early in the day, it was quite bright and airy. A sports hall, with a large area set aside for benches and tables. But everyone were shooed away from the tables around four, as they were preparing for the first dinner seating. Only half of the tables were needed for each seating, but it meant a quite packed crowd for the second half of each day. The setup of the brewery stands did not allow much in the way of presentation. Some of the stands along the walls had some posters and artwork, but the tables in the middle had a setup that looked more like a homebrew festival. This might have been a deliberate decision, but I would say that the best breweries in the world would have deserved a more professional presentation. The Haandbryggeriet festival a week ago had a setup where all the breweries were able so present themselves in a much better way. The food was hyped a lot, anticipating a close-to-NOMA-experience, or, at least, what in the programme was called an uncompromizing gourmet experience, with food and beer pairings. The Friday meal was nice enough, with a piece of tender meat, mashed potatoes, a green sauce with aromatic hops and some watercress. Honest food, but not gourmet quality. And this could have been served all day without any time slots with us walking up to a counter and asking for a plate when we got hungry. This would have meant no need to rope off more than a small part of the hall, leaving ample seating for everyone. And the food available at other times? Fairly average Danish sausages with a variety of mustards based on beer. Period. No salads, no cheese, no cured meat, nothing resembling gourmet at all. One main ingredient in a beer festival is water. Sure, bottled water with the Mikkeller logo is fun. But running water is also needed. Water for drinking, water for washing your hands and even your face. Water for rinsing your glass. Even water as in toilets. And as this was in an athletic venue, there were toilets roped off somewhere. Too expensive to clean? Come on! And where were the hosts? They were briefly spotted, but a highlight would have been a trumpet fanfare and some words of welcome at noon on Friday. Maybe a stage with some round table talks with the beer personalities present, too? If less space was allocated to sit down dinners, there could easily have been a stage at the back of the hall. some of the showmanship we have seen from Mikkeller at previous festivals in Copenhagen would have been nice. There were some seminars this time around, but they were not widely publicised. The one I went too, on blogging, was poorly attended, and just when the discussion was starting, we were shooed out again. There was, on the second day, a poster advertising free wi-fi – but the password wasn’t working. Fine venue, with some adjustments. Given that, everything else can be tweaked and adjusted the next time. And it is very much a matter of very high expectations when you use big words when building up the advance buzz. The real test if I liked it: Will I be back? Frankly, I don’t think I’d ever attend a beer festival with assigned “dining times”, whatever the quality of the food might happen to be. That’s almost like being at school…. Knut, who brought the Gose? The Gose was called Marry me in Goslar, from the Farmer’s Cabinet brewery. With pink Himalayan salt, no less. the man who brews this fantastic Gose. Hopefully it will be possible to buy this Gose in Denmark in a few months from now. Marry me in Goslar, Terry’s Gose, is one of the best beer I’ve ever had. Agree. And I was very surprised by the beer pairing for the Friday dinner. All the attendees agreed that it was pretty bad. Who the he.. was the sommelier, I wonder? I personally thought the food on Saturday was absolutely horrendous. Even the serving staff (which I assume had limited gastronomic education) apologized for the miserable piece of uncooked meat that was still left on my plate. And as you say, where were the locally produced cheese etc that would make the festival live up to the hyped gastronomic intentions? Great beer and great crowd though so I will be back. I skipped the food on Saturday, both the dinner and the gold flaked hot dogs. Also agree, by and large – for me the beer selection on offer was simply so awesome that a lot of other (entirely legitimate) concerns paled in comparison. I do agree that there could have been better opportunities for the brewers to present themselves (the De Struise party wagon was the stellar exception). And I was one of those who liked the food, including the beer-and-food-pairing, which I thought worked quite well – particularly on the Friday. The kitchen staff seemed a bit tired Saturday. 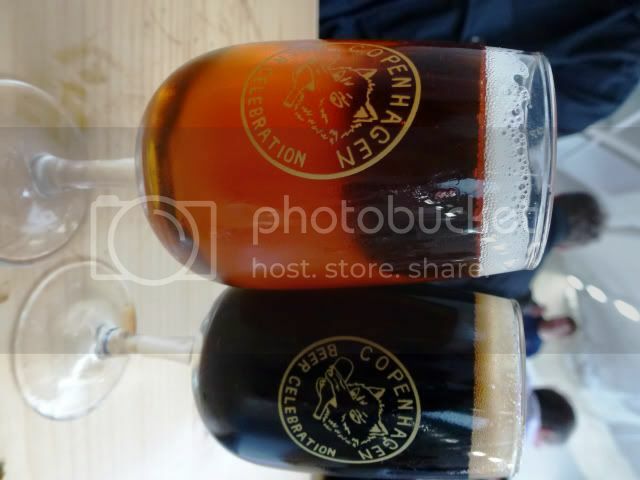 For my take on the festivities, see http://londonbeer.wordpress.com ! I know this is for 2012’s CBC but does anyone know of any spare tickets for 2015? I’m sure they need plenty of staff for the event, maybe you could work for a session and attend another? Get in touch with them! Good idea, I’ll contact them now. Though I’d much prefer the reseller websites brought their individual session tickets down from over £400! !